About a month from now, I will go to Lowell Michigan and teach a landscape workshop. For quite a few years, I have been pondering how to make landscape (either plein air or studio) more dynamic. 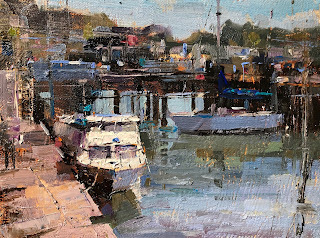 I have gained more experiences by participating multiple plein air painting competitions. 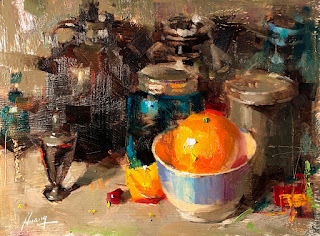 In this workshop I want to share with you what I have learned these a couple of years. We still have a few opening. 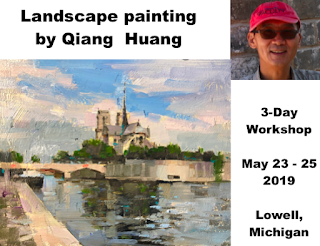 If you are interested in knowing my process of painting landscapes, please join me in Michigan. For detailed information, please check my website or Qiang Huang Workshop at Lowell, and sign up. Those pink flowers are not roses, they are ranunculus. But they so much like roses. 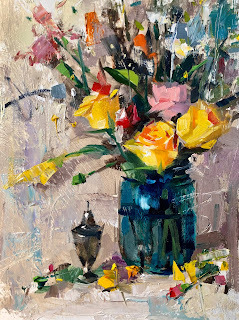 I am always looking for chances I can improve my floral paintings. This one has give me a baby step improvement. Sometimes, it is hard to say weather I am going too much or not. The 2nd demo is here. I feel I am so borderline now. It was fun to play the abstractness on the background, but I do wonder where this spirit of playing leads me to. Even my son comments quite often that dad is still a teenager. He just wants to play. Left the Deep South, I have arrived at the West Coast. 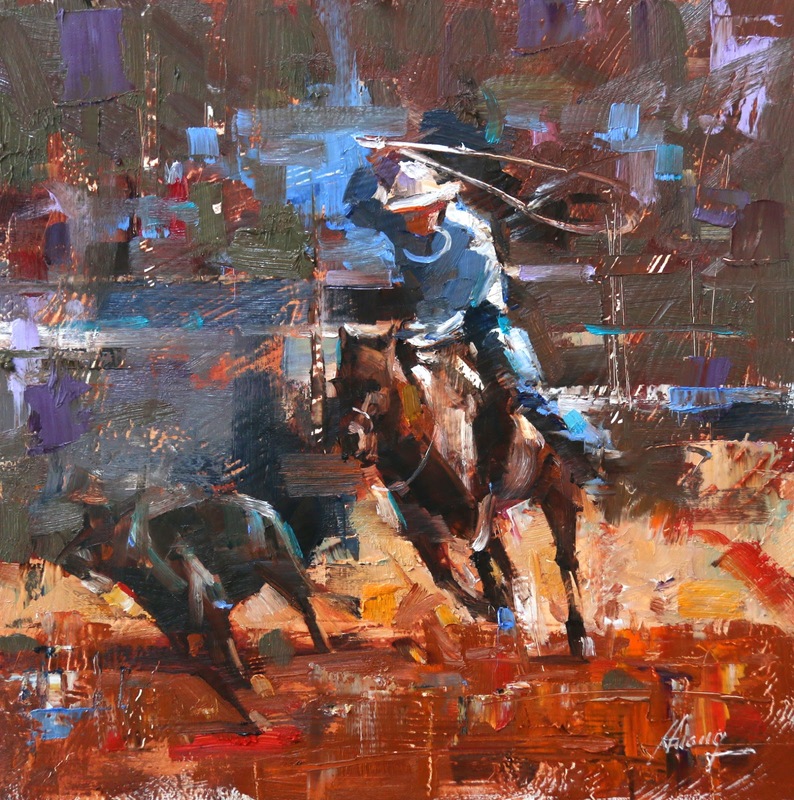 This is the demo 1 I did at Springfield Oregon. 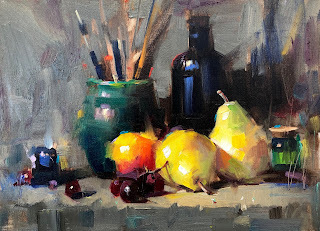 I want thank Gene Costanza and the Emerald Art Center for organizing my workshop, and thanks to all artists for coming. It rains a lot here, but we had fun indoors. 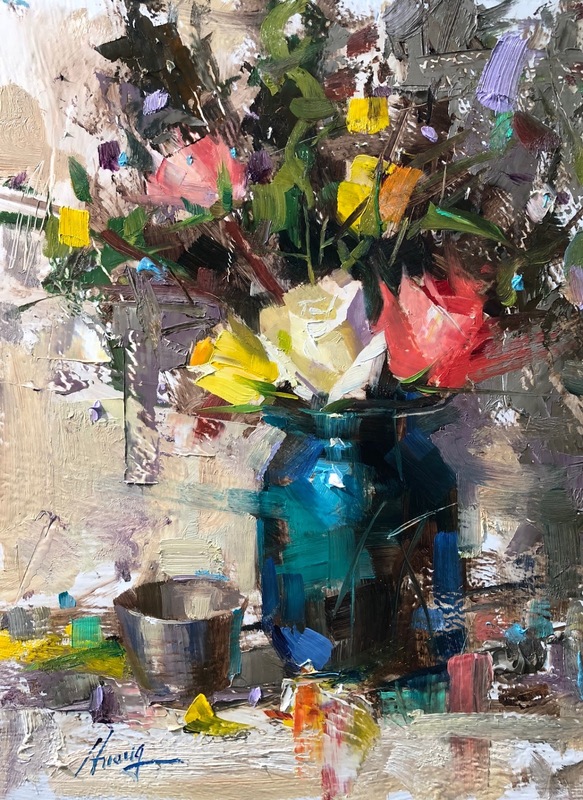 This is my 4th demo at Lake Martin: painting flowers. I put a few dogwood flowers. I don't know I did a good job on them or not. "Demo at Lake Martin 2019 3"
This is demo 3 I did at Lake Martin. It is also my favorite one. I have started to pay attention on color scheme design with this painting. The harmony of the color design on this painting was my intention. This is my 2nd demo at Lake Martin. Silver, brass, and porcelain. 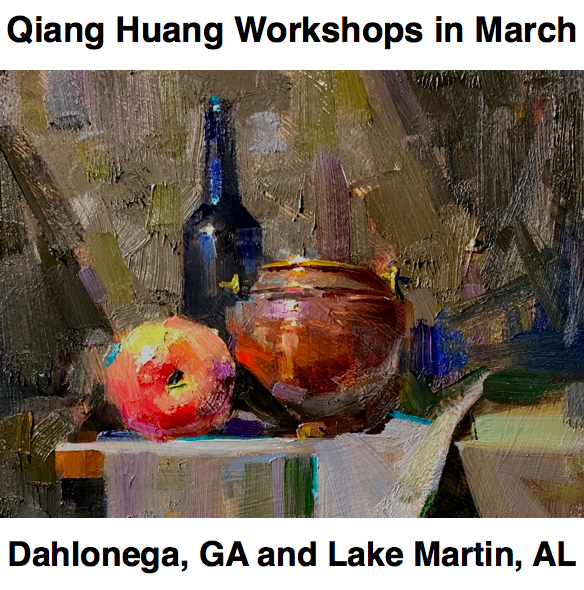 This is my first demo on the workshop at the Tallapoosa School of Art at Lake Martin, AL. I want to thank Dorothy and George Littleton for organizing this workshop, and thank all the artists for attending. Lake Martin is a beautiful place. 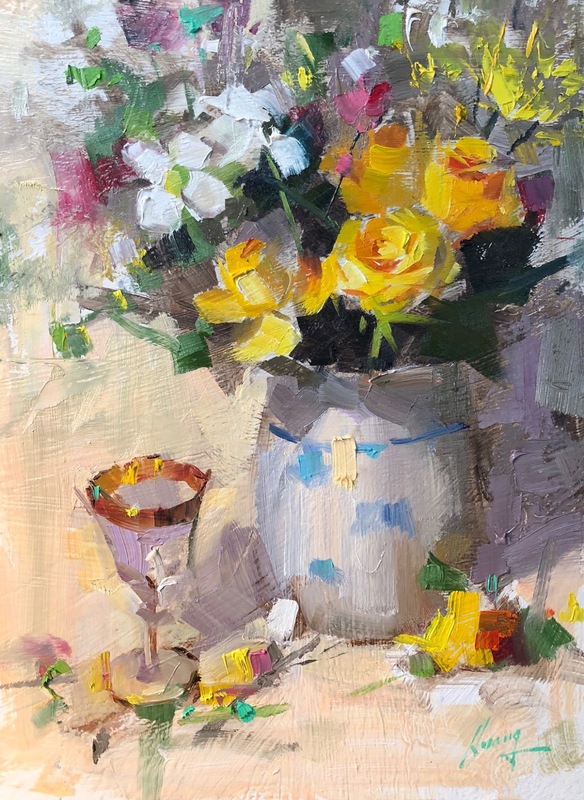 If you are interested to visit and paint there, please check: http://www.tallapoosaworkshops.com. 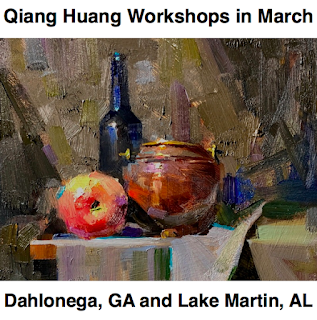 I was requested to do a demo at Dahlonega after my workshop. So I did this one. I have experimented a little on the composition. You have seen so many of my demo paintings, probably get bored with them because they are very similar. I decided to do this demo a little different. 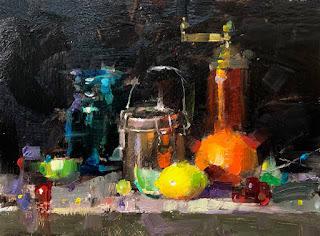 "Demo at Dahlonega 2019 4"
This is the last day of my Dahlonega workshop. 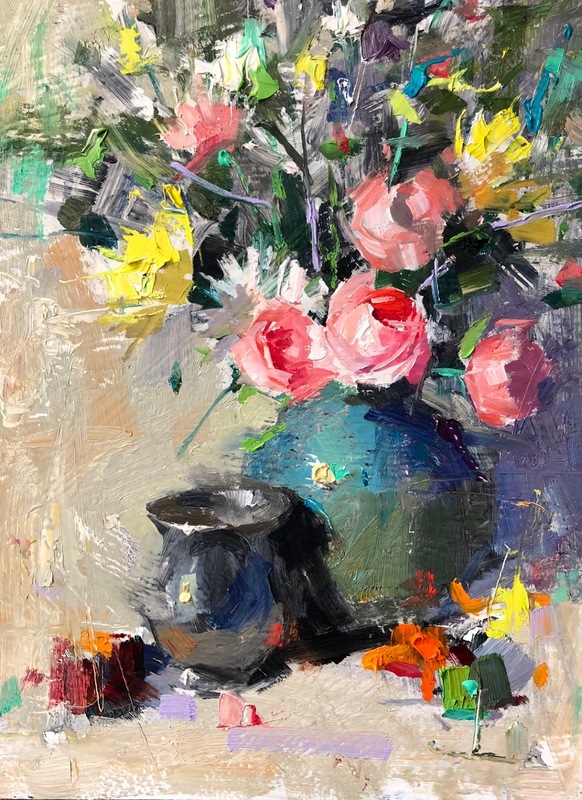 This is my floral painting demo . The third demo, I have used more textures and broken colors. It was fun. Demo 2 at Dahlonega. Falling in love with cobalt teal and pthalo blue. 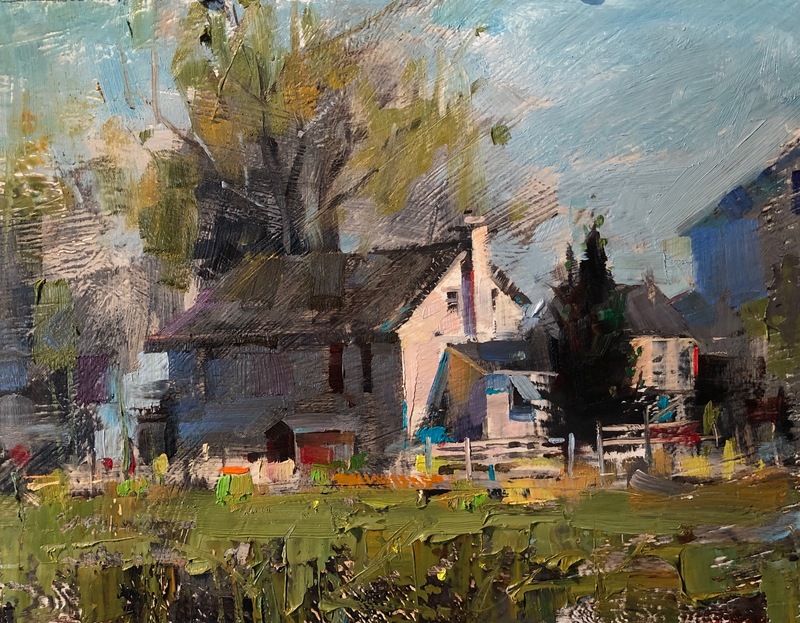 "Demo at Dahlonega 2019 1"
I am on my teaching trips again. 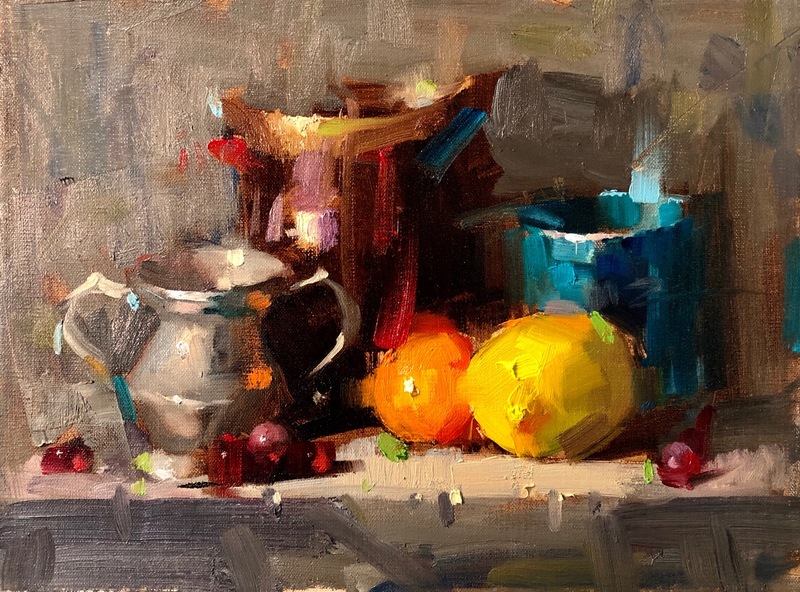 At this moment I am at Dahlonega GA, teaching a still life workshop. I want to thank Anita Elder for organizing this workshop, and thanks to all the artists for coming and paint with me. 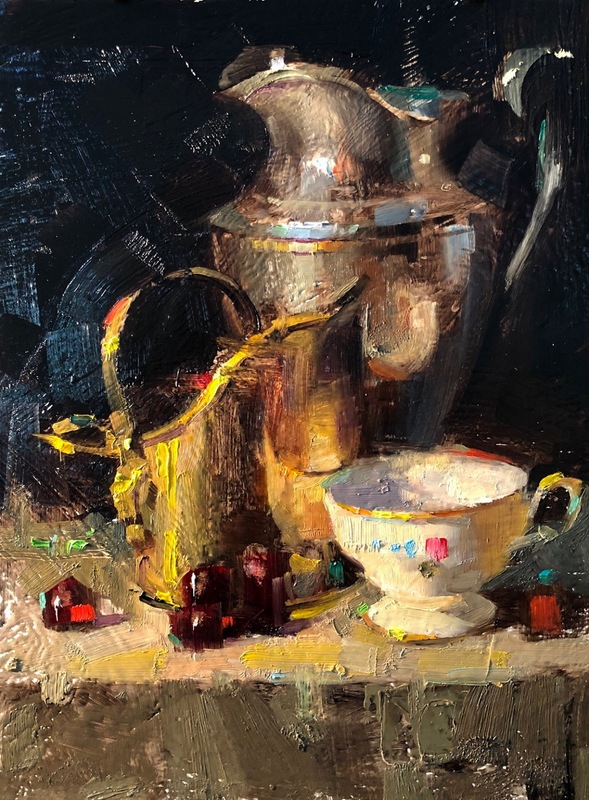 This is my today's demo painting. I have managed and painted a few paintings between my teaching trips. I did this one from a photo taken by one of my wife's friends. Austin has changed significantly these a few years. Another delayed painting post. I don't understand (actually, I DO understand) why we all are so busy everyday. There are so many things we must do. We do it, nothing will happen, but if we don't do it, we will be in trouble. If you have seen I have been quiet for a long time, which means I am busier. Art is easy, but life is way harder. I taught many workshops, I must say I have learned way more from my students than I have taught them. There are three major sufferings we all have to face: aging, sickness, and death. Money and fame are useless in front of these three. Many of my art students have to deal with these suffering everyday. I admire their tenacity and courage. I am on my way to maturity. I wish I can post my painting more on time, but when life throws a curved ball, we must adapt. I have nothing to complain, just hope life can be a little easier. 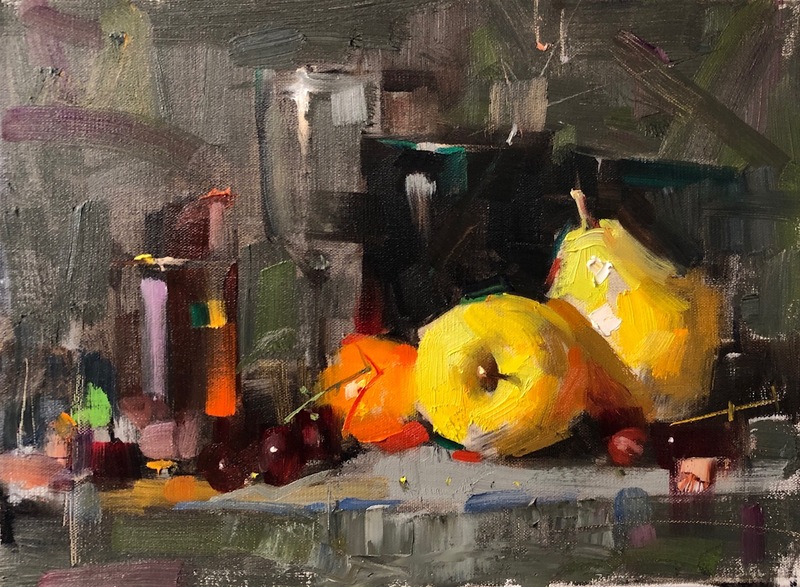 This is my second demo in Paso Robles. 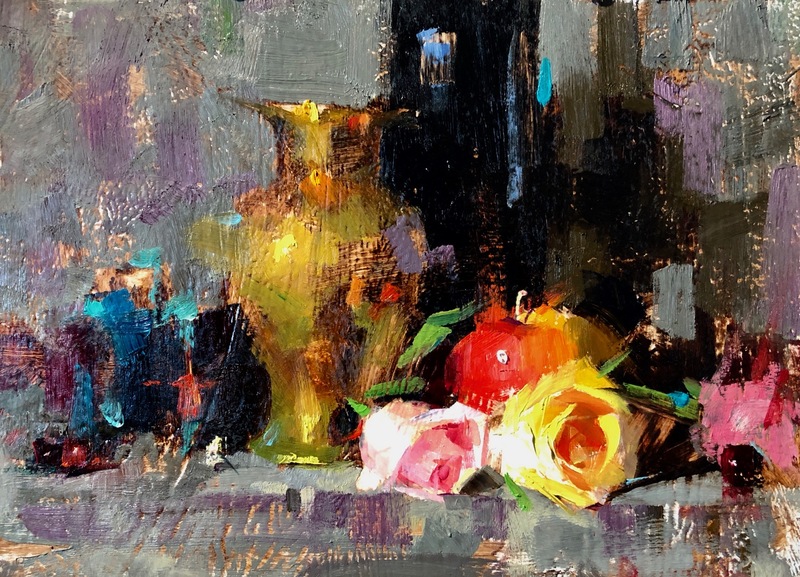 This is my 1st demo on my Paso Robles workshop. I really want to thank Marion and Robert for offering their lovely home for me to stay. 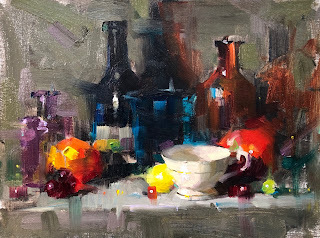 Thanks to all California artists for attending this workshop. 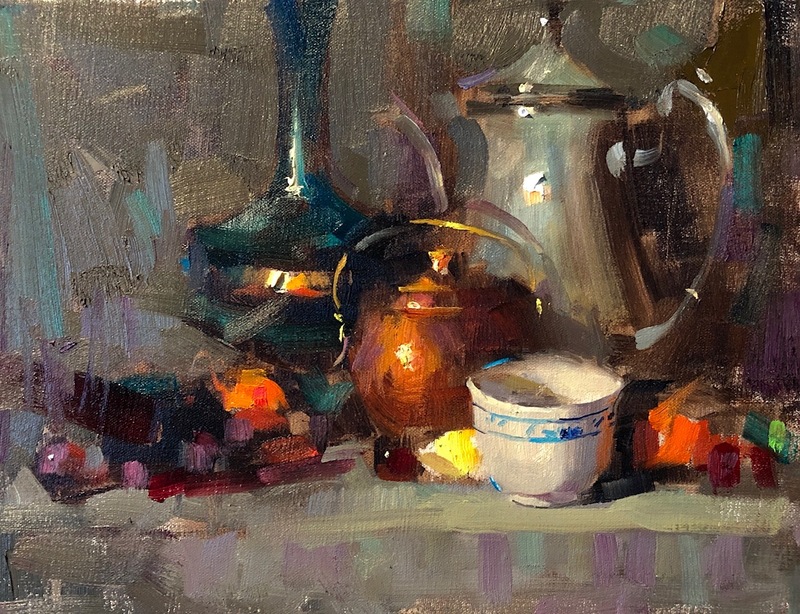 Not long ago, I did a workshop in Paso Robles CA. It was so beautiful there. I got a chance to visit quite few beautiful places. I did this painting today from a photo I took at Morro Bay. This painting is available on dailypaintworks.com. 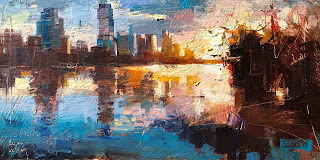 I have been organize "Painting in China" trip for quite a few years. Every September I take a group artists and friends go to China. We sightseeing in a few beautiful or well known tourist places, then we stay in a less tourist place and paint for a few days. This video shows the place we painted in our 2018 China trip. It was an old town called "Shang-li" in Sichuan Province. Unfortunately, it was raining everyday, but we painted anyway. 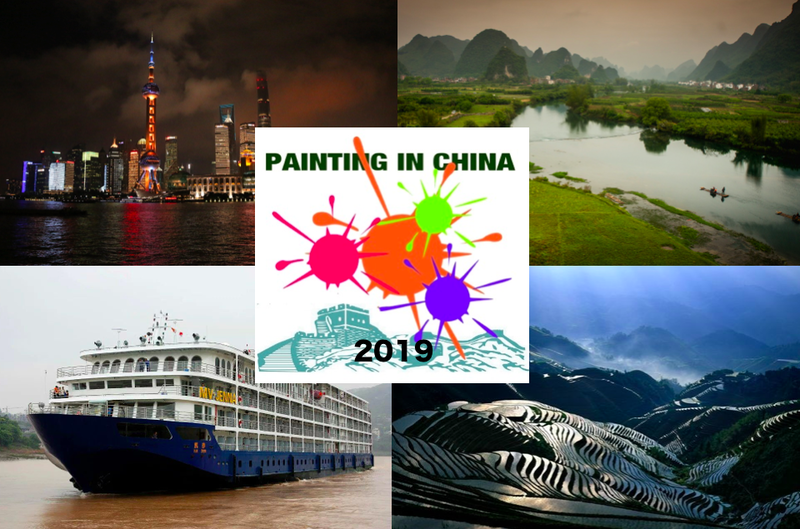 Please enjoy this short video, and Please check my "China 2019" trip. I hope you can join me and we will have another wonderful time this coming September. 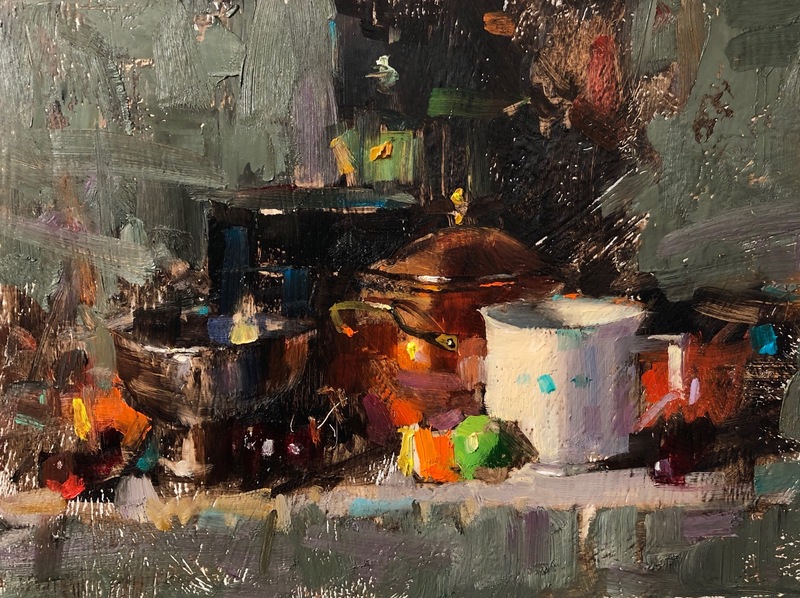 For Demo 4 I have used a ref photo of a very busy scene, but now I are not afraid busy subject matter any more. I have tricks to deal with them. I hope all the workshop artists also got my tricks. 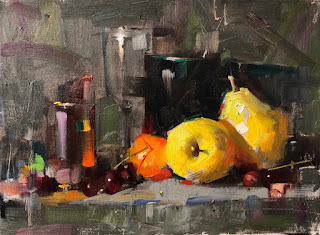 My workshop at Tucson was 4 days: 2-day still life and 2-day landscape. 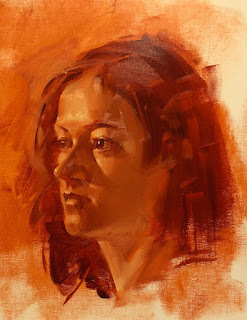 This was the demo I did on the third day of the workshop. Hello my artist friends: I will travel to the southern states: Georgia and Alabama and teach two 4-day still life workshops. 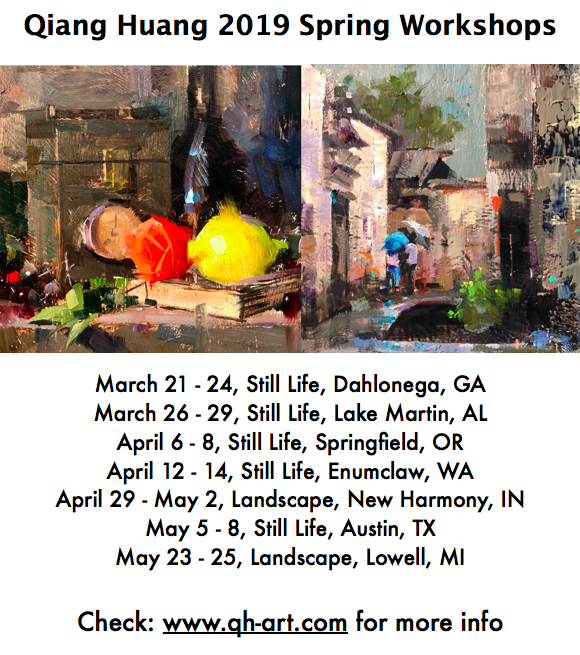 On March 21-24, I will teach at the Art Loft in Dahlonega, GA, and then I will teach at the Tallapoosa School of Art at Lake Martin, AL. 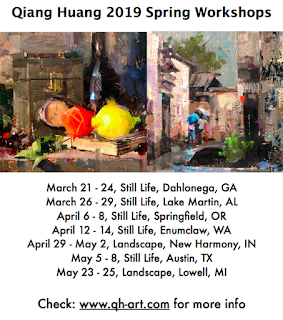 If you are in the Southern states, and want to improve your art skills. Please contact the corresponding workshops organizers. I am looking forward to meeting you. Thanks. I did this painting yesterday based on a photo I took at San Angelo TX last October. 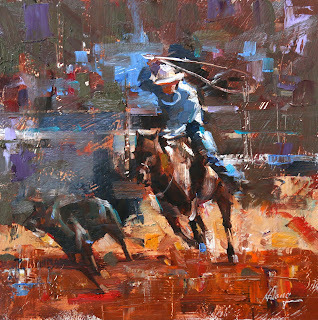 I think it is first cowboy painting I have done. I am considering sending this painting to a gallery soon. Personally, I have tried to establish a process or a procedure I can deal with any narrative topics. My attention is going into the abstractive expressions of all the painting elements: shape, value, color, texture, etc. I want to go beyond techniques and skills, so the my painting becomes a true art. Now we get something exciting. 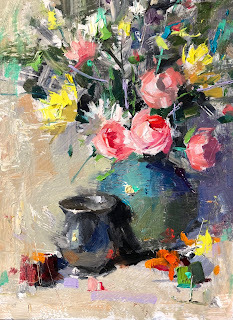 Playing the texture and colors as a piece of visual music, that was my main idea when I painted this demo painting. I have enjoyed the freedom of the brush strokes and the color distribution. However, I must be mindful that I need a control to keep the painting representational. Do not want to go pure abstractness. One of artist in the workshop is an orthopedic surgeon. He told me that the person doing this kind of art should be a specialist called an "optical realistic abstractionist". I need to put my "head studies" aside for a while now, and come back to field I feel more comfortable to be in. 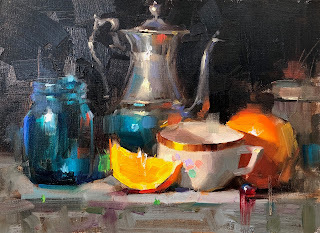 At the end of January, I did a workshop in Tucson Arizona. I want to Thank Brenda Semanick for organize this wonderful event, and thanks to all the artists who attended this workshop. I like the shimmering colors in this demo. 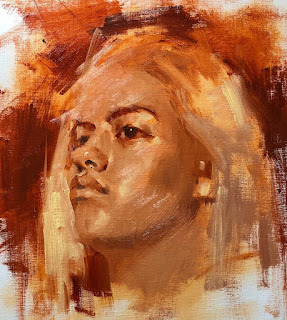 Today's head study is relatively more challenge, I can not play the light and shadow game on this one, and the perspective is not easy either. I am happy that the model has strong features on her nose and mouth. I am rather weak in painting the nose and mouth area, I have got a chance today to practice. The entire process of today's painting was a struggle, but result was not too bad. Man! I wish I can do head studies everyday. I have done a few "head studies" after I got back home. I did not show all of them. They are kind of boring, and full of problems. This is what I did today. It is relatively good. The nose has some minor issues, and I did not have time to do the ear. I will say I have reached the mediocre level of portrait painting. The face looks close to normal human being now. 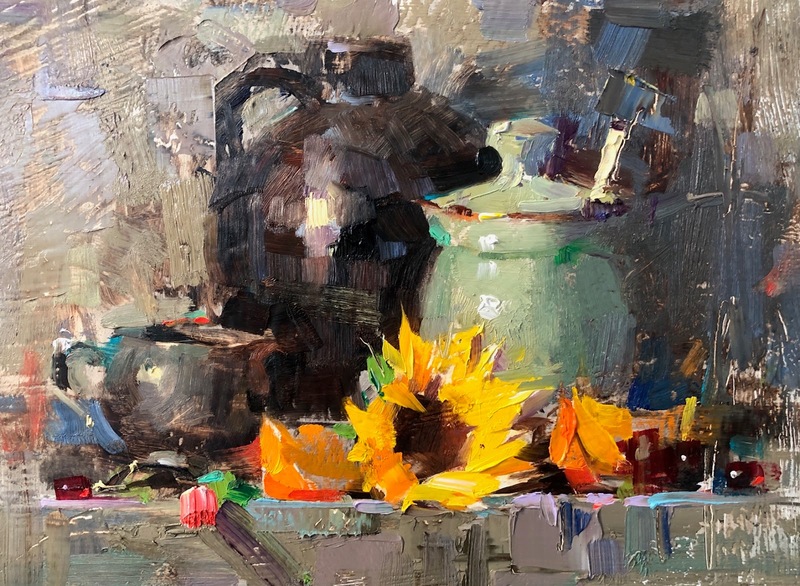 At this moment, I won't say there is much of art in my head studies, because I still concentrate only on how to copy the face accurately, I have not give much of thought about design and composition. I just try to avoid anatomic, proportional, and perspective mistakes. That is all. Today is the Chinese New Year, the year of pig. As a matter of fact, I was born in one of those years of pigs. 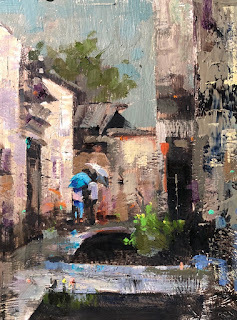 Well, I don't want to talk too much about pigs, but it maybe a good time to kick off my "Painting in China 2019" program. I have worked hard quite a few days and getting the trip finalized and webpages developed. In this September, we have planned to cruise the Yangtze River, then painting at the spectacular Guilin. I will teach a 5-day landscape painting workshop at Yangshuo, a small town in Guilin area. We also arranged an additional Beijing - Xi'an - Shanghai trip for people who visit China the first time. For detailed information, please check: http://www.qh-art.com/china-2019.html. We will keep the group relatively small, so seats are limited. Many people have asked me about this exciting trip. Please take your action now. My 2019 Art teaching has started in full swing. I feel it may be a good idea to list a few of my forth coming workshops on my social media. 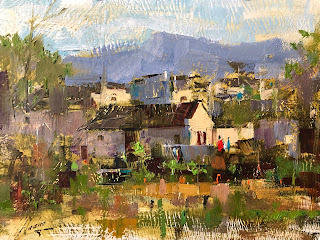 I travel quite a bit and enjoy sharing what I know about painting to my art friends. I hope this posting helps you to plan your art learning at locations close to you. I teach many workshops, maybe too many. I do consider to slow down (I am not allowed to say that I am getting old, but you know). So please take the opportunity that my teaching is still relatively easy to access. Please visit my website and contact the corresponding workshop organizers. Thanks. 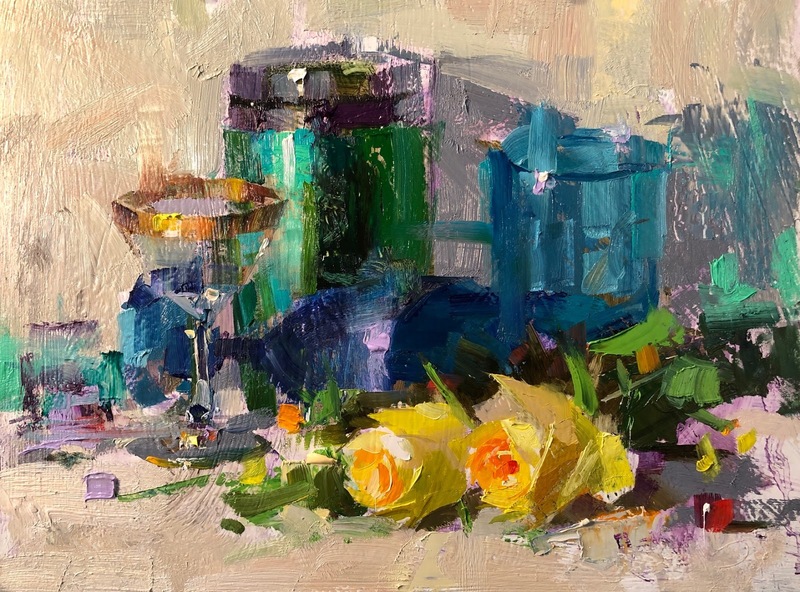 This is my 3rd demo on my Charleston workshop. As a matter of fact, I have painted using this ref photo before, and get more and more excited about the direction I am heading to. "Figures in landscape" may be the genre I am getting in. The potential of the artistic expression is tremendous. I am happy my art tree starts to bear fruit. Many years of exploration in still life and landscape painting have given me a peek what the future will look like. Many friends have considered that I have established my art. Well, I am afraid not. I have seen just the beginning.